In the wake of relatively low-risk contract extensions given to Jorge Polanco and Max Kepler, some wondered if this meant the Minnesota Twins were ready to make a bigger splash with a veteran contributor. Depending on your perspective, they’ve done just that. 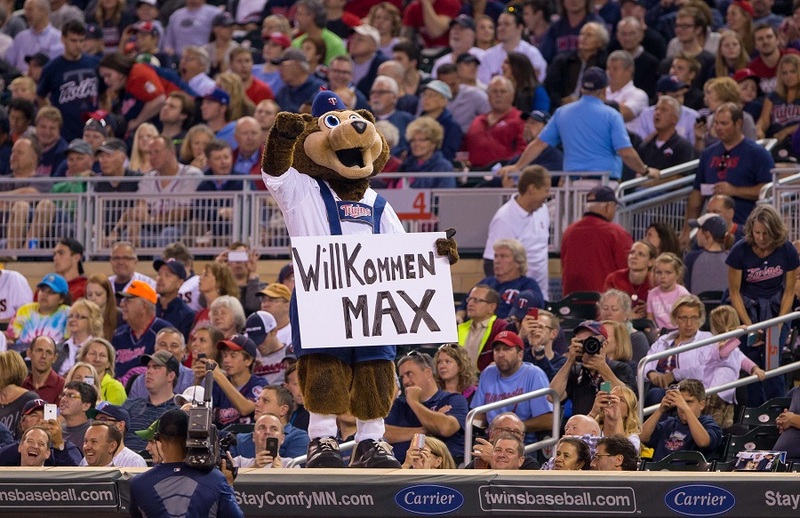 Multiple sources have confirmed to Twins Daily that the team has extended their contract with Koopmeinens Amusements & Golf Cart Repair to rent the TC Bear costume through 2023. Financial terms of the agreement were not disclosed, but it is expected to cover theft, fur replacement, and the climate-controlled Tuff Shed where the head is stored. “We’re thrilled to continue partnering with the Koopmeinens team,” said Twins GM Thad Levine. The Royalton-based business, located in a haunted industrial park off Highway 10, has provided costume rental for the franchise ever since they provided the low bid for mascot services in 2004. Levine said the quality of the suit has never been in doubt. TC Bear is now the longest-running mascot in team history, although that mark does come with an asterisk after the ill-fated “Replace TC Bear with a Real Bear” promotion on June 30, 2013, when a Kodiak brown bear in a powder blue Tom Brunansky jersey interrupted TC’s consecutive game streak and ate Clete Thomas. I always wondered what happened to Clete. He had that short run that showed so much promise. Good ending. Did not see that coming. "...FBI discovered that all the tuition money was going to the Bhagwan Shree Rajneesh..."
Someone has been watching a lot of Netflix recently. Excellent work Stu. Surprised by the violent ending. I still blame Bruno to this day for any Twins hitting woes when they are in the middle of a team slump. I’m a little concerned about his age. Maybe they should’ve only gone four years. He had good LAR(laughs above replacement) last year but they weren’t as high in the decibels. Is this just a one year hiccup or the start of a new trend? I have some under ten aged nephews and they weren’t so excited to see him as I’d hoped. The Cedar Rapids Kernels have a nice up and coming mascot in Shucks. It’s always nice to see homegrown talent make it to the big league club and I’m concerned they may have blocked him with this move. I wouldn't have done anything more than a two-way contract that required him to keep the red bird and the fish costumes handy.He better have been working on his flopping around on the ground, too - the Blue Wahoo gig is tougher than just standing there like an ear of corn. It's the little things that make these so great.It says so much the Twins' management wouldn't pony up for anything stronger than "soapy water" to clean the headgear of cat birthing matter. Did they front load the contract? If not, pfft. This might be the deal that convinces Berrios, Rosario and Gibson that we're serious about competing and that they should extend as well. Thank you for using keywords so Google can file this with the other articles on this topic. Well, I was searching "feral cat births" earlier this morning, but this article did not appear in the results, so, yeah not really. “The barn cats used the head to birth their litters,” said Levine. All I know is the Pohlads have done a great job of burying the Clete Thomas story and Stu is showing great courage by trying to put it back out there. When you google this there is scarce information on it. We need to keep this story alive! The Twins have multiple bobblehead giveaways every year just to push what happened to Clete down in the search results. Let me get this straight - this team has missed the playoffs for 1 straight seasons and instead of signing a real bear that could maybe charge, attack or otherwise startle the opponent they sign this bum? A mascot bear who can’t even pull it together to run in the mascot race? Noooo, instead for him we have a designated runner (thank you Wanda, an actual athlete) so that TC can busy himself shooting fans, including children, with a cannon? Unconscionable. I'm guessing the financial terms are staggering.TC seemed to be on the outs at Twins Fest and was being pursued by the Boston Bruins.Twins must have realized how important he was and ante'd up. Could this be where the Mauer savings went? I'm glad they extended him. I was worried they were going to flip him for some prospect mascot in July. I'm not sure if the story was actually buried. I believe that Kodiak brown bear received some MVP votes the following November in recognition of his contribution to the team. We've collectively just pushed Clete out of our memory.